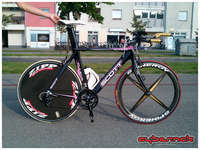 My TT bike with the disc wheel fitted. 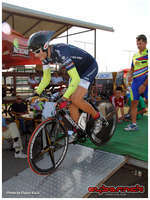 And here's the revised TT setup (without the skinsuit, obviously). 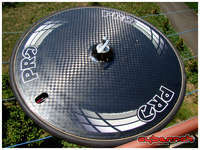 Since I wasn't happy with the "ZIPP" disc wheel, I sold it and bought this new PRO (by Shimano) tubular disc wheel. 12K carbon, Dura Ace hub and about 1200g in weight. 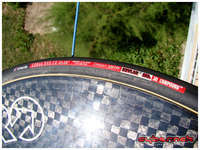 Brand new Vittoria Corsa Evo CX 23mm tubular tyre. 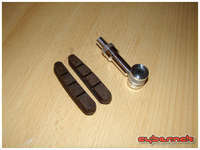 I've also had to get some carbon-specific cork brake pads and a "crack pipe" valve/pump adapter. 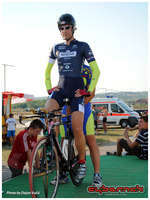 22/Aug/2012 - Bosnia & Herzegovina's National TT Championship at Zaluzani race track near Banja Luka. It was the hottest day of the year, with 38'C in the shade and 42'C out in the sun on the track! 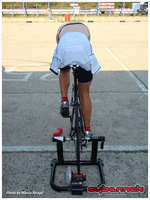 Doing a warm-up on my new Elite SuperCrono turbo-trainer. The term "warm-up" shouldn't be taken lightly with the ambiental temperature this high! 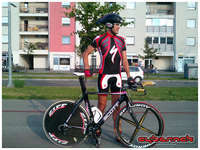 Rolling to the start ramp, with my new disc wheel, new aero helmet and new team skinsuit :-). Beautiful 12K carbon sheen :-). Quick briefing before the start. Proudly wearing number 1 and starting from the last spot, as I was still the reigning national TT champion, though unsure if I will able to defend the title, as I was not in the best shape this season. Up on the ramp, during the starting procedure. First lap and already feeling the side-effects of 42'C. 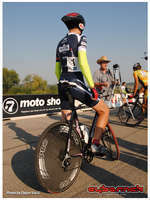 Although I am generally used to riding in high temperatures, I was really suffering that day.